(a) How wide is a single slit that produces its first minimum for 633-nm light at an angle of $28.0^\circ$? (b) At what angle will the second minimum be? This is College Physics Answers with Shaun Dychko. We're dealing with light have a wavelength 633 nanometers and the first minimum is at an angle of 28 degrees we're told and we have this formula for finding the minima in the diffraction pattern. And we have capital <i>D</i> is the slit width times sine of the angle equals the order of the minimum times the wavelengths of light. And so we're going to solve for capital <i>D</i> because we want to know how wide is the slit and so will divide both sides by sine theta and we get <i>D</i> is <i>m lambda</i> over sine theta. 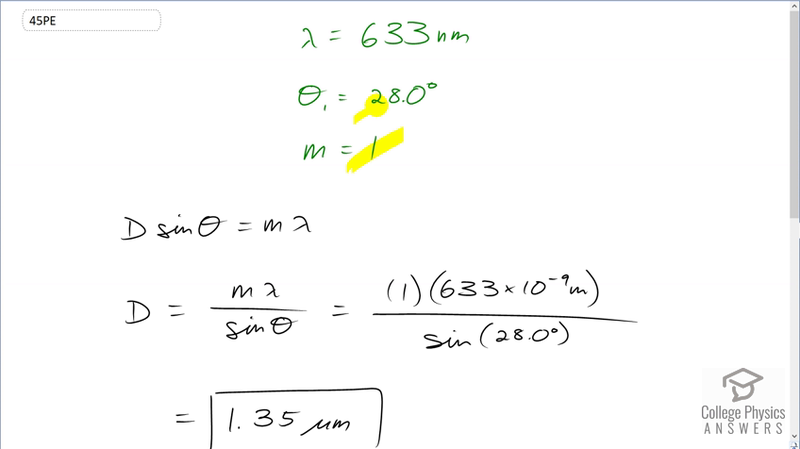 So the first order minimum which is one occurs at an angle of 28 degrees and so we have one times 633 times ten to the minus nine meters divided by sine of 28 degrees giving us 1.35 micrometers is the width of the slit. And then part <i>b</i> asks us to figure out what would the angle be to the second order minimum so we can rearrange this formula now and solve it for theta because we know what capital <i>D</i> is now because we've just found it in part <i>a</i>. And we'll divide both sides by <i>D</i> and take the inverse sine of both sides and that gives us this formula that the angle to a minimum is inverse sine of the order times a wavelength divided by the slit width and so the angle to the second order minimum is the inverse sine of two times the wavelength divided by the slit width, and I'm using extra digits here to avoid intermediate rounding error, 1.3483 times ten to the minus six meters slit width and this gives us an angle of 69.9 degrees.